Socialist New York congressional hopeful Alexandria Ocasio-Cortez lamented the closing of her former employer but glided over the fact that it was closing because of the minimum-wage hikes she supports. On Monday, Ocasio-Cortez visited The Coffee Shop, a Union Square icon for years, to emphasize her familiarity with the lives of everyday workers. She cited her experience at the restaurant as a case study in bettering oneself and the future. "The restaurant I used to work at is closing its doors. I swung by today to say hi one last time and kid around with friends like old times," she said on Monday. "I'm a normal, working person who chose to run for office, because I believe we can have a better future. You can do it too. We all can." Her former employers announced the closure of the eatery in July, blaming in part the policies that Ocasio-Cortez has campaigned on. The Coffee Shop co-owner and president Charles Milite told the New York Post that escalating rents as well as New York's minimum-wage hikes were to blame for shuttering the company, which employed 150 workers. "The times have changed in our industry," he said at the time. "The rents are very high and now the minimum wage is going up and we have a huge number of employees." Milite did not respond to an email seeking comment, and his direct line went straight to voicemail, which was not accepting messages. Labor watchdogs said that Ocasio-Cortez's talk of a better future for everyone does not square with the experience of large minimum-wage hikes like the $15 hourly rate she supports. Michael Saltsman of the Employment Policies Institute said politicians are to blame for the closure of businesses like The Coffee Place, which had survived for nearly 30 years. Saltsman said that rather than visiting her soon-to-be unemployed coworkers, Ocasio-Cortez should reevaluate her approach to economic regulation. "Ocasio-Cortez's desired ‘living wage' of $15 an hour has been a living hell for many small business owners in New York, who've been unable to offset the cost through higher prices," he told the Washington Free Beacon. "It's fine to mourn the impending closure of your former employer—it's better to understand the misguided minimum-wage mandates that contributed to that closure." Ocasio-Cortez has bucked criticism of her support for a $15 minimum wage—more than double the national rate of $7.25—in the past. 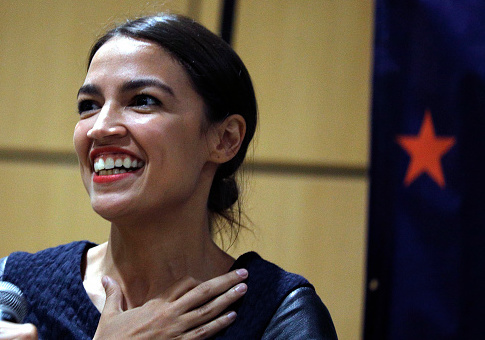 "The fact that paying people enough to live is considered a ‘radical, far-left' position says more about the current state of our nation's politics than it does mine," she said in July. The Ocasio-Cortez campaign did not respond to request for comment. This entry was posted in Politics and tagged 2018 Election, Alexandria Ocasio-Cortez, Minimum Wage, New York City. Bookmark the permalink.